. Folktales 昔ばなし mukashibanashi about Fudo .
. Benjo no Fudo Son 便所の不動尊 Fudo as God of the Toilet . near the temple Tooshooji 東正寺 Tosho-Ji there is a well with clear water, now famous as the "water of Fudo" お不動さんの名水. Once a statue of Fudo Myo-O had been found in the mountain nearby, so the villagers built this temple for it. Now it is in a Fudo-In 不動院 hall, founded by 源為義従者 Minamoto no Tameyoshi in 1288. Every year on the 5th of January the ritual of Shuushoo-E 修正会 is celebrated. the "Festival of the Demons of Yakushi Nyorai 大薬師の鬼祭". 12 men from Atsuta of the age of 25 and 42 (13 men on a leapyear) participate. The demon masks of the temple are made of strong thick paper and ward off evil influence for the coming year. The masks are imitations of the one's from the "Bull Festival of Kyoto" 京都牛祭. the region of Moshōbu 母生父 Moshobu became poorer and poorer over the years. To find out the reason villagers went to Konpirasan in Shikoku. There an oracle told them that since they had dirtied the river, this was what happened. In the river there were "Seven Waterfalls and Seven Fudo". Now the villagers begun to venerate the deity and in no time things improved and they could build three storage houses for their harvest. Between the hamlet of Kogake 小掛集落 and Karimataishi　刈又石集落 there is a waterfall dedicated to Fudo Myo-O. At the Fudo Hhall there, the messenger of Fudo, the Dragon Deity 竜神 takes care of business. If someone taking a retreat at the hall (komori 籠り) the deity comes to have a look at him. About 1951 they say, there was also an apparition of the Dragon Deity near the great cedar tree near the hall, but it was only a small dragon. In the small hamlet of 鬼神集落 Onigami the protector deity, in fact 不動様　Fudo Sama, is also called オボシナサマ Oboshina sama. Its festival is the 28th day of the 3rd lunar month, now on May 8. On the evening before the festival people put their boiled vegetables in a bento lunch box and meet at the shrine, to eat it all together. They are not allowed to eat any meat on this occasion. Then in 1956 some brave one eat some meat and what do you say - the next day was a huge fire in the hamlet and 17 homes burned down.
. 不動明王と鬼伝説　Oni Demon Legends and Fudo . In the Taisho period, 工藤むら Kudo Mura was worried about the health of his daughter さだ Sada. He consulted a local Shaman, who told him she should to go to 赤倉山 Mount Akakurayama. For three years and three months, he went to venerate the ウブスナさま Ubusuna-Sama in the village of 鼻和村 Hanawa. At the end of this time, 成田の不動様 the great Fudo of Narita showed his form. The following year from the New Year on she went to Akakura and the shrine 大石神社 Oishi Jinja for three days of prayer and eventually became a Gomiso Shaman. The shrine 赤倉山神社 Akakurayama Jinja is located at Higashiiwakisan-1-39 Hyakuzawa, Hirosaki. - Akakura Fudo Waterfall 赤倉不動滝 . On the days with nine in the ninth lunar month (09, 19 and 29) it is customary to prepare Shitogi Mochi with the newly harvested rice and offer them to the deity. 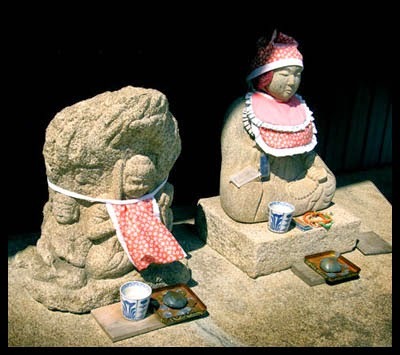 The old ladies and housewifes offer three each to Inari, 月山様 Gassan, 日月様 Deities of Sun and Moon, Jizo, 馬の神様 the Deity of Horses, Fudo Myo-O, 金精様 Konsei sama (Deity of the Male Symbol) and 権現様 Gongen sama.
. 古懸山不動院 Kogakesan Fudo-In .
. Narita Fudo 成田不動 . A man named D once borrowed some money and then forgot all about it. When the lender came to his home to remind him, he got all angry. Then he said, サガシ if you look for it, you might find a 金の壺 pot of gold. The man believed him and went to look for it like crazy. Eventually mister D went to the Fudo of Imabari and asked for help. He suddenly remembered he had borrowed money, gave it back all all were cured.
. Fudo Legends 03 - Fukushima .
. Fudo Legends 04 - from Gifu to Iwate .
. Fudo Legends 05 - from Kagawa to Kyoto .
. Fudo Legends 06 - Mie to Miyazaki .
. Fudo Legends 07 - Nagano to Niigata .
. Fudo Legends 08 - Oita to Shiga .
. Fudo Legends 09 - Shizuoka to Toyama .
. Fudo Legends 10 - Wakayama to Yamanashi .